You can convert AOL Emails into EML file formats. The software helps you to convert AOL emails into your selected Email Client's file format, like: Thunderbird and Apple Mail. The tool allows you to convert AOL PFC File to EML format. For each email, the tool creates one EML file, which can be opened easily on email clients like: Thunderbird, Apple Mail, etc. It allows you to share your mails easily via removable devices. This tool converts all data with same structure as it was in PFC file. It maintains integrity of data during conversion process, which makes this tool more trustworthy. AOL PFC to EML converter software provides you an option to change the name of output file according to specified way during the export. Naming convention can be applied according to date, date & subject, and more combinations. AOL PFC to EML converter software is fully compatible with Windows 10 & all below versions of Windows OS. No kind of compatibility issue arises during the conversion procedure due to the application's abilities. You can filter AOL email for conversion according to date. You just need to apply date range like from 1/12/2012 to 12/12/2014 and the tool will convert all AOL emails to EML file which lies between the applied date ranges. The tool also lets you convert and export multiple PFC files at once. For this, you just need to add all AOL PFC files one by one to the software after that you can convert them individually or in bulk as per your requirement and convenience. What is AOL PFC File? AOL PFC is an Email Storage file used to store AOL Emails downloaded from server to your Personal Computer using AOL Desktop Software. PFC file lets you access AOL Emails and make changes without the dependency on internet connection. All applied changes are saved in PFC file and automatically at the next connection to internet; the changes will be synchronized to AOL server. The tool is needed for conversion of AOL emails from PFC file to EML, but you can also convert selected emails. You may share EML files in your friend circle easily without internet connection. Emails are easily accessible from EML file using Thunderbird, Apple Mail, and a number of other free and open source Email Clients. Convert AOL PFC to EML file format. In addition, AOL PFC to EML Converter tool helps to move from AOL to any other Email Client, which best suits, your requirements. Is this tool able to convert PFC file without Installation of AOL Desktop? 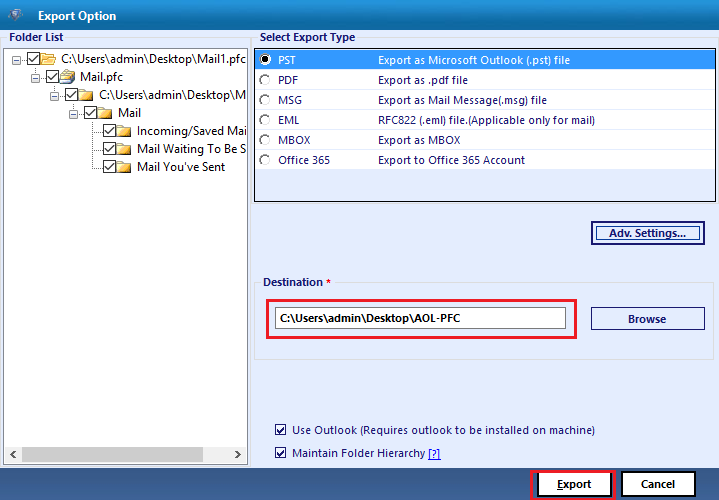 Yes, the tool does not require AOL Desktop for conversion of emails from PFC. Can I use this tool on my Mac Machine? No, the converter software is only compatible with Windows OS installed Machine. Does this software convert AOL Emails into any other file formats other than EML? 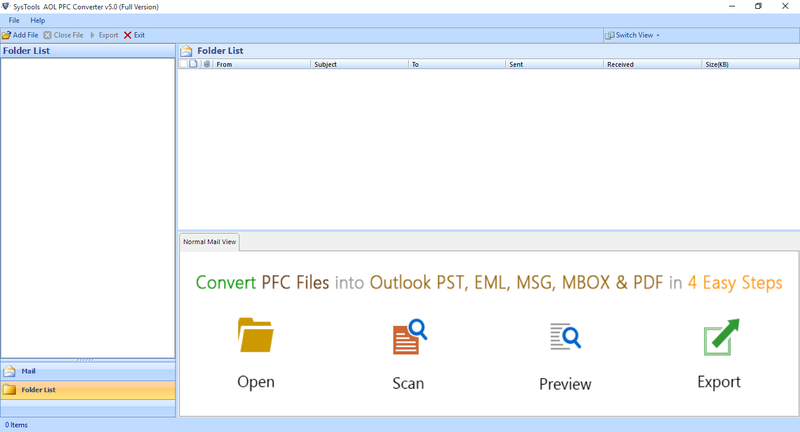 Yes, you can convert AOL Emails from PFC File to EML file formats using this tool. Is it possible to convert more than one PFC file to EML at once? Yes, it is possible to perform bulk conversion using AOL PFC File to EML Converter tool. The converter tool is good which helped me to convert my important emails from AOL PFC file to EML. Initially I was confused about this tool and its conversion techniques. However, the support team helped me a lot in the conversion of my PFC files. It is the best tool for conversion of PFC files. I have used several tools for the same purpose but no other tool was like this. Its conversion steps, UI, accuracy and speed are amazing and i am going to suggest this application to all my clients too.